Having the best glue for shoes will not only save your favorite footwear from the bin but will also save you a lot of money? There is nothing more frustrating than having the heel or sole of your favorite tennis shoes or work footwear starts coming loose. If you use your sneakers all day long you are sure to have to stick them at some stage if you don’t want to constantly be buying new sneakers to wear. When gluing your sneakers you need to look at what the different types of glues offer you. You will need an adhesive that will bond to many different types of material. View the Best Shoe Glue, Below. What is the Best Glue for Shoe Soles? What Glue Do Cobblers Use? Will Gorilla Glue Work On Shoe Soles? Gorilla Glue VS Shoe Goo? How do you fix the sole of a Shoe? What kind of glue is used to make shoes? Different Types of Glue to Repair Your Shoes? How To Fix Shoe Sole Separation? Most repair shops will use adhesive when repairing your sole, heel or upper and so can you. You need an adhesive that will not only set quickly, is also heat resistant and waterproof, especially when repairing your sole. The adhesive you choose should also not stiffen when set, it should allow for the flexibility of the shoe. It should be able to bond with leather, crepe, and rubber. It should also be able to bond with rubber and polyurethane. Finding the best adhesive your footwear is easy with the E6000 237032 Adhesive which is a cement based product that will help you give your old sneakers new life. 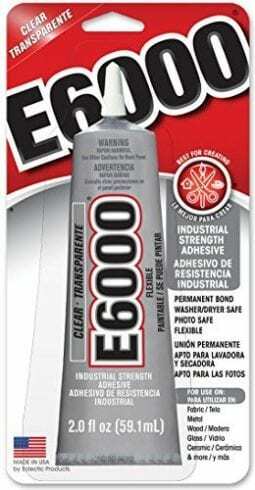 Even if you have a split sole, or a sole that is peeling, or just a loose heel, the E6000 adhesive does the job. 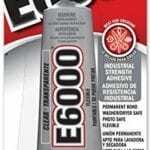 The E6000 comes in a 2-ounce tube with a built-in applicator tip to help you apply the adhesive to the right areas, without getting any on your hands or fingers. It is very forgiving in that it will not dry instantly. After applying the adhesive you have five minutes to make the adjustments you need to, to ensure you sole is aligned properly before the adhesive will start to set. The curing time for the adhesive is 24 – 72 hours. 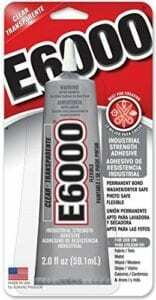 The E6000 is one of the best industrial strength adhesive that will bond with leather and other footwear materials. It is temperature resistant so it will remain flexible so allow your sole to move with your foot. It is also waterproof, non-flammable and is washer and dryer safe. Dry’s white. An industrial strength substance that remains flexible, is waterproof, non-flammable and washer and dryer safe. This is the best shoe adhesive to help you repair your favorite sneakers. Also one of the best sole glues that is easy to apply with the built-in applicator and takes only 24 to 72 hours to cure properly. Don’t you hate having to clamp your footwear and maybe damaging them when trying to fix your sole buy gluing it? This adhesive eliminates that worry as it bonds instantly without the need for clamping. This cobbler adhesive will ensure that your sole is fixed again in no time, without expanding or drying thick as some of the other brands will do. It also dries clear so you can use it on any color sneakers with confidence. The flexible bond that is created when using this boot-fix adhesive is not affected by temperature, hot or cold. It is also moisture resistant and will not come loose even when exposed to water. The clear coloring ensures no black smudges on your footwear or discoloration of your hands or fingers. It will bond with rubber and vinyl, making it best for repairing your boots, sneakers, hiking boots or even that smart pair of dress shoes. A long-lasting adhesive for all your footwear repair needs. The boot-fix shoe adhesive will give you the confidence to repair your own sneakers, boots or any other footwear without having to spend a lot of money. It bonds with rubber, vinyl and other materials, dries clear so is safe for any color and there is no need for clamping as it dries almost instantly with no curing time needed. Not only can you reaffix your sole, but you can also patch holes in your footwear with the shoe goo repair adhesive. Repair ing your sneakers has never been easier, or more affordable. 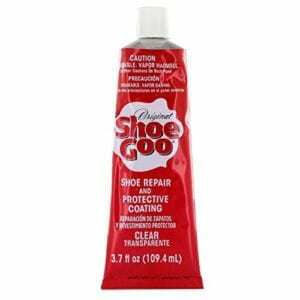 Give new life to your old footwear with the shoe goo repair adhesive. The adhesive will not only affix your sole, it offers a protective coating for your leather, vinyl, rubber or canvas footwear. It is an extremely pliable and flexible adhesive that can also fill and seal a hole in your soles. Waterproof, temperature resistant and long lasting, this is the best repair substance to use on sneakers. Skateboarders love this glue because it not only repairs their shoes it also protects them and seals any holes in your soles protecting them from moisture. The Goo, takes around 24 hours to cure but will remain strong once set, and will even offer you more traction on your athletic sneakers than before. The shoe goo repair is best for your athletic shoes, sneakers or any other footwear you need to repair. Not only can you reaffix your sole but patch any holes or repair damage to the soles from skateboarding or other activities. Sets in 24 hours, waterproof and temperature resistant, this glue bonds to leather, vinyl and most shoe materials. 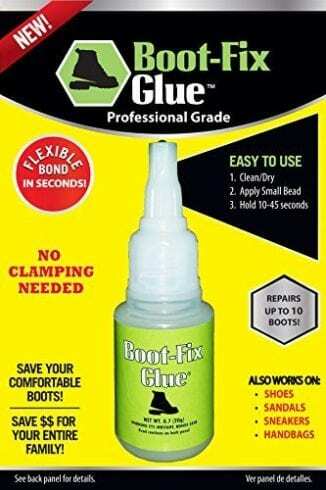 Just like boot-fix glue, this shoe-fix adhesive will bond instantly without the need for clamping and curing times. It will not expand nor dry thick to give you an uncomfortable feeling in your footwear once repaired. Shoe-fix adhesive is not affected by heat or cold, and it is moisture resistant and will not break down when exposed to water. Shoe-fix adhesive will give you a long-lasting bond that is flexible to allow your sole to move naturally. The adhesive is clear, so you do not have to worry about matching colors to your sneakers, it will also not leave any black residual marks on your footwear or fingers. 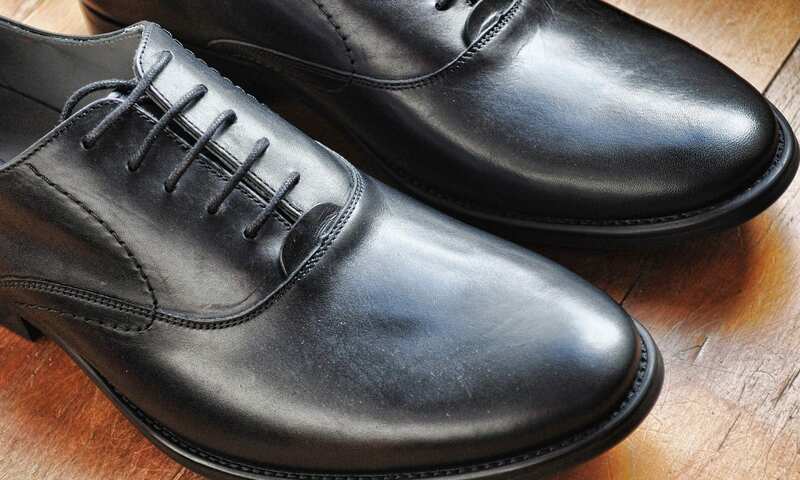 Shoe-glue will bond all rubber and vinyl, so fixing those formal dress shoes, sandals, or your athletic styles footwear with confidence is no longer a problem. 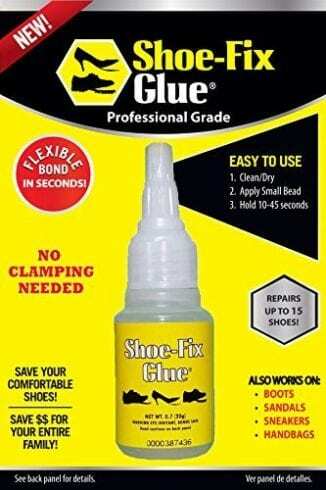 Shoe-glue is specifically formulated to enable you to repair any shoe, anywhere and anytime. A glue designed and developed specifically to fix your sneakers with. There is no clamping or curing time, it dies flexible and is clear so there are no hassles with color matching. Temperature and moisture resistant it creates a strong long-lasting bond and will bond to almost any shoe material there is. This is the ideal adhesive to use on sneakers, climbing shoes, skateboard shoes, in fact, any of your athletic and hiking boots. The Gear Aid Freesole is the answer to peeling soles, scuffed and damaged toes, and damaged heels. The Gear Aid Freesole will rebond your soles to your footwear creating a flexible product that is the answer to all your peeling soles. It will rebuild toes and heels drying to a solid rubber in only 2 hours. When cured it creates a flexible, rubber product which is temperature resistant, flexible and waterproof. Create a strong toe cap for your hiking boots, fix your heels or soles in only a few hours and save yourself a lot of money at the same time. Gear Aid Freesole will offer a concentrated formula that will allow for minimal shrinkage and can be used for thick repairs. Due to its formula, it only requires one application to give you a flexible, sturdy and solid solution to damaged footwear. Comes in a one-ounce tube. One of the best adhesives for rubber soles, the Gear Aid Freesole will create a thick, flexible rubber product that will not only repair your footwear but also create a layer of protection. It can be used to create a solid toe cap on your hiking boots, temperature, and water resistant as well as being flexible. An industrial strength substance that will ensure that when you fix your sole it remains fixed. It is versatile allowing flexibility once set and is one hundred percent waterproof, safe for use both indoors and outdoors. The glue is versatile and can be used for any type of footwear, it will bond to any kind of material making it best for your leather, vinyl, canvas or rubber soles. It works by expanding into the materials to create a very strong bond. The glue is water activated polyurethane. You will need to clamp your footwear for a period of 1 to 2 hours for best results. Temperature resistant, water resistant and will not break down when it is exposed to the elements, this glue bonds with almost any material for a safe, long-lasting fix for your soles, or to fill any holes in your soles. The glue will expand up to three times into the material of your footwear and this is what forms the formidable bond to ensure your sole remains affixed to your footwear. The original Gorilla Glue is not only strong and durable but also sets with the flexibility you need when using it to repair the soles of your footwear. It will bond to almost any material with an unbreakable bond. Waterproof and temperature resistant it will stand up to the elements. Fix holes in your soles or reattach them easily. Loctite is a silicone based adhesive that will bond to any number of different materials including rubber, plastics and vinyl. It is best for repairing your damaged shoes. Loctite Ultra Gel is a waterproof sealant adhesive which will create a protective shield for your soles once adhered. It is temperature resistant and creates a flexible bond that allows you to move naturally in your footwear once adhered. It can be used both indoor and outdoor as it creates a seal against moisture. 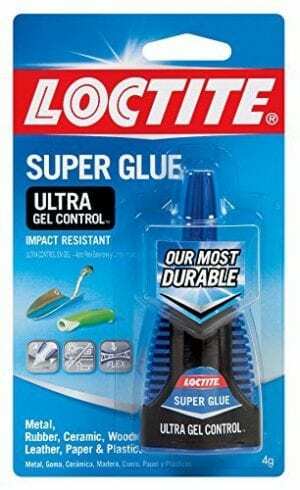 Loctite Ultra Gel will not crack or peel, and it will not shrink once applied. 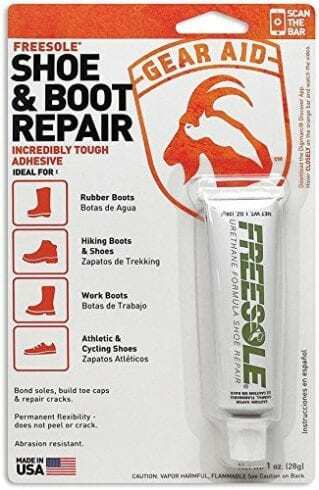 One of the strongest adhesives on the market it comes in a 1 oz tube, which is sure to last you a long time, saving you money and time when needing to repair your damaged hiking boots, sneakers or any other footwear that has a peeling sole, or damaged heel or toe. Creating a temperature resistant, water resistant flexible bond on your shoes this is the best adhesive to use on your damaged heels or toes, and fix your peeling soles. It is easy to apply and creates a long lasting strong bond that will give your old shoes some new life. A urethane adhesive that is best to use on any of your damaged footwear. It is formulated to be flexible and strong after curing and also offers abrasion protection. It is completely safe to use on any natural or synthetic materials such as neoprene, hypalon and rubber. You can also use this best adhesive to patch holes in your soles. When it dries it is clear and will not clash with the color of your shoes. It is temperature resistant as well as water resistant and will offer you a flexible bond that will also protect your shoes. The flexible urethane adhesive will create a bond that is best for use on your waders, gumshoes and other footwear that you use in water, best for fishermen to use to repair their footwear. No clamping and a short drying time give you the ultimate in shoe repair adhesive that will save you money and time when looking to repair damaged shoes. 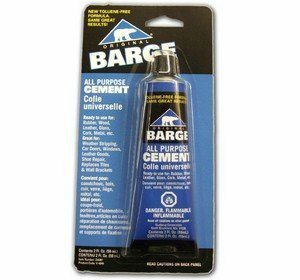 A fantastic product especially for fishermen who need to repair their wader and boots, this urethane adhesive will create a strong waterproof, temperature resistant bond that will seal your soles and offer a flexible bond. It dries clear, best use on any color shoe. Offers the best protection for your shoes as well. The Gorilla 4500104 dries to a strong, flexible bond to your shoes and will work on almost any material, including leather, vinyl, rubber and more, best glue for tennis shoes or any other athletic shoes, boots or even dress shoes. This is a non-foaming formula and is exceptionally easy to apply and use. It will create a strong clear bond, so no matter what the color of your shoes are you will not have a problem when applying this shoe adhesive. Water resistant, as well as being impervious to hot or cold temperatures, the Gorilla creates a strong flexible bond. One of the best adhesives to be able to fill in holes in your damaged soles as well as re-bonding peeling soles. It comes in a 1.75 oz tube, is long lasting and will save you time and money by repairing your shoes at home with ease. A shoe adhesive that offers a strong, flexible bond that adheres to almost any material. It is water as well as temperature resistant and can be used to patch holes in your sole as well as repair peeling soles. It dries clear so can be used on any color shoe without problems. This is a cement type adhesive with a Neoprene base that will give you a strong, flexible bond for your damaged, peeling soles, heels or toes on your favorite shoes. A short drying time of only 10 to 15 minutes it is easy and quick to use, best for emergency fixes. This adhesive will bond to leather, rubber, vinyl, PVC or Polyurethane as well as most any other fabrics or materials around. Glue your damaged athletic sneakers, work shoes, boots and more with this best adhesive. It is one of the best adhesives for shoe repairs on the market at the moment. The adhesive is temperature resistant and will not be affected by hot or cold, it is waterproof with the best seal, and it creates a wonderful flexible bond which is what you need when fixing your soles. The original formula is not only strong and flexible it is safe to use on any shoes and comes in a toluene free tube. A strong, flexible bond is created when you use this fantastic cement type shoe adhesive to affix your peeling soles, damaged heels or even the uppers of your footwear. It has a short drying time of only 10 to 15 minutes and creates a waterproof seal that is also temperature resistant. You should consider an adhesive that will dry quickly, and cure strong and flexible. You should also ensure your adhesive is both water and temperature resistant, it will not be the best outcome if you stick your sole and then step in a puddle outside to find your sole separating again as your adhesive dissolves in water. Cement and Polyurethane based adhesives are best for shoe repairs as they dry flexible. Cobblers use adhesives that are both strong and flexible when bonded. They use an adhesive that is temperature and water resistant and will bond securely to the sole of your shoe. There is not one main adhesive that is used, cobblers will use different adhesives for different issues. Gorilla is a polyurethane waterproof adhesive that will no doubt work on the soles of your shoes. It is an industrial strength adhesive that will provide a very strong bond and is designed to work on rubber as well as soft material. There are two different types of Gorilla Glues, there is the original adhesive and then you get the super gorilla adhesive. 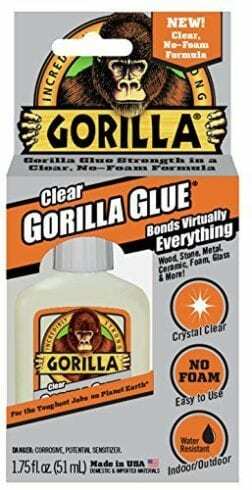 Some Gorilla Glues have a foaming effect when used. It has been used effectively for adhering peeling soles or fixing damaged shoes. Gorilla is designed to bond and seal to most any type of material including footwear materials such as leather, rubber and more. It is temperature and water resistant, it can be a little difficult to apply as it expands when applied and you need to be aware of any spills or drips that might occur when using it. Shoe Goo on the other is specifically designed to be used on shoes. It will work on other materials but that is not its main objective. It will work on soles as well as uppers and all footwear materials such as leather, canvas, and rubber. It dries flexible and waterproof and is extremely durable. It is one of the favorite glues for gluing your sneakers. There are a few easy steps to follow when looking to fix the sole of your footwear items. You need to ensure that your broken shoes are both clean and dry before starting to repair your shoes. You can also roughen up the surfaces of the sole and the bottom of the footwear to enable the adhesive to get a better bond. Make sure you apply the adhesive to the surface and then let it set for the amount of time stipulated on your specific type of adhesive you are using. Each product will have a different curing time for their product. Some will set almost immediately or in only a few minutes. Glues that are used to make shoes are generally heat and cold resistant as well as being waterproof (click here for water shoes). When drying they must remain flexible in order to allow the footwear to be comfortable. They will give you protection on the footwear against abrasion and also cope with stress to the joints. Industrial style adhesives that are both strong and flexible are used when making shoes. There are four basic types of footwear adhesive that are used to repair shoes and we take a look at them for you. This type of adhesive is heat and cold resistant as well as being waterproof. Remaining flexible it is best for repairing soles that have separated or have been damaged. Neoprene Cement adhesive offers an extremely strong bond, is very fast drying and is non-corrosive. This is the best footwear adhesive for all your athletic sneakers or shoes with rubber soles. This is a very popular type of adhesive as it is extremely fast drying and requires very little curing time. It bonds permanently and it is easily available. It can be used to not only repair leaking soles, it also affixes the peeling soles. This is an adhesive that will bond on almost any material and is often used for footwear repair. Be sure to choose an epoxy adhesive with less catalyst, as this will avoid cracking and brittleness. This type of footwear adhesive takes a long time to dry, up to 24 hours minimum drying time is needed to get the correct bond that is strong and stable. 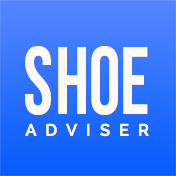 If you have a shoe that has lost its sole, there is a simple and easy way to get it reaffixed, without having to take it to a shoe repairer and pay a lot of money. Clean the shoe and sole surfaces which you need to adhere together. Remove the sole completely, this will make it a lot easier to work with the sole. Apply your adhesive to the sole and the bottom of the shoe you are looking to repair. Lastly, leave it to set. 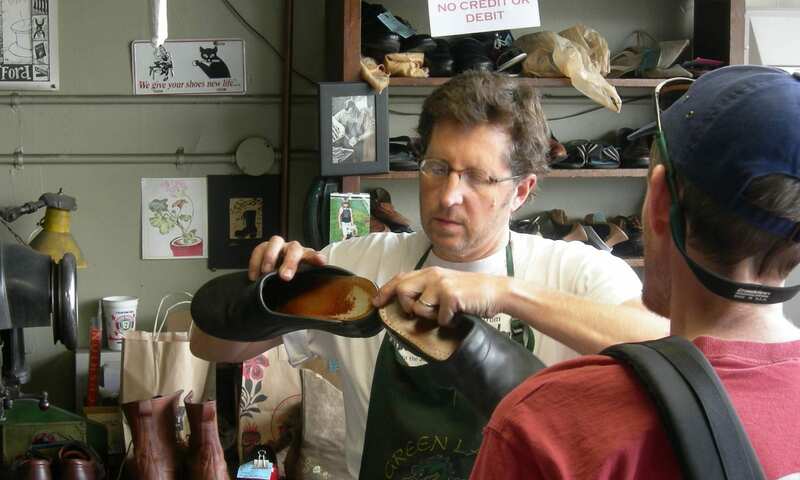 Having to take your shoes into a footwear repairer is not only expensive it is also time-consuming. With the best adhesives that are available on the market, it is easy and quick to fix your shoes at home on your own. There are a number of glues that are designed specifically to help you repair your shoes, make sure you choose one that offers an effect bond, offers flexibility as well as being temperature resistant as well as waterproof and follow the manufacturer’s instructions when apply and curing the adhesive. E6000 237032 Adhesive is a cement adhesive that has a curing time of between 24 and 72 hours and gives you a stable, secure bond that will give your shoes new life. It is best for repairing split soles, peeling soles, and damaged toes or heels. One of the best footwear adhesive that will give your shoes new life and is our best choice for footwear glues for 2019. Easy to apply with a built-in applicator tip it is a very forgiving type of adhesive as it allows you up to 5 minutes after application to ensure that you get your alignment correct for you make the final bond. An industrial strength substance that will remain bonded for a long time. E6000 bonds best to almost any footwear material including leather, vinyl, canvas and more. It dries to a flexible, temperature and water resistant finish that will ensure that your footwear is giving back its strength and comfort that it was before the damage occurred. It is also non-flammable and is safe to use in your washer and dryer. It dries to a white finish. 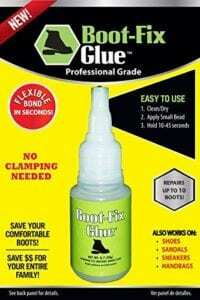 Boot-Fix is a cobbler adhesive that will bond almost instantly and there is no need for clamping or long curing time. It will dry to a clear finish so will not it is safe to use on any color shoe. It will also not create any black smudges and will also not discolor your hands of fingers when using this adhesive. Bonding to any footwear based material such as leather, vinyl, and canvas, it can be used to fix rubber soles that have separated, fix holes in damages soles or damage to the uppers of your shoes. It will affix your separated heels and damaged toes of your shoes easily and quickly with almost no curing time needed. The bond that is created by this adhesive is temperature and moisture resistant, once affixed, it will create a permanent bond and will give your shoes new life. It will not dry thick as some of the other brands on the market and will restore your sole to its former glory. Flexibility and stability is a hallmark of this best shoe adhesive and makes it our premium choice for footwear glues in 2019. 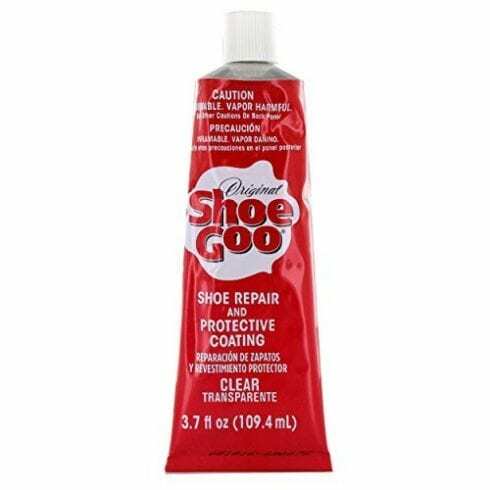 Shoe Goo Repair is a multipurpose shoe repair adhesive that can be used to patch holes, reaffix separated sole and repair damaged heels or toes giving your favorite shoe new life. The Shoe Goo Repair offers a protective coating when applied and can be used on leather, canvas or vinyl as well as rubber soles. This is a popular shoe repair adhesive to use when repairing your sneakers (read the study). Waterproof as well as temperature resistant adhesive technology that is long lasting and will repair almost any shoe. A very popular adhesive to use for skateboarders as it also offers abrasive protection. The adhesive takes up to 24 hours to cure, but will remain very strong and flexible bond once set and will even offer you more traction when used on your athletic shoes. The best price of this adhesive makes it our best value choice for 2019. Use it on any of your shoes with confidence for a flexible, strong bond that will reinvigorate your old shoes and give you a lot more use out of them. We hope you enjoyed our article on "The 10 Best Glue for Shoes in 2019", if so, please share and rate it. Great review on Shoe Glue didn’t know there were so many to choose from, I always use Shoe goo, been using this product for years its one of the best glues out there.